David Hahn telephoned Sunday night (Oct 17) to inform us that they'd made it to North Carolina. Problems with his computer equipment, however, left him unable to e-mail his latest report. He did say that their estimated time of arrival at the Virginia Aviation Museum would be sometime between 3 and 5 p.m. Monday (Oct 18) afternoon. 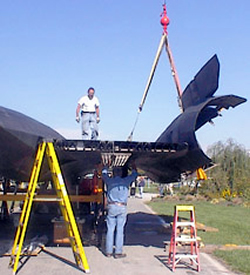 Indeed, some of the pieces of the SR-71 have already arrived at the museum. REPORT #22: October 19, 1999 - The Best Laid Plans of Cows and Men. From Memphis, Tennessee east the hills gently grow into rolling mountains. The graceful mountain ranges of the eastern United States are geologic grandfathers to the western mountain ranges and we are approaching the still grand stumps of what had been tremendous mountains. These eastern mountain ranges were created by collision of the great continental techtonic plates in geologic time too far back to comfortably imagine. Although once grander in scale and scope than the Rocky Mountains of today the Appalachian rmountain range has been patiently carved into their present graceful forms by the timeless, relentless power of water. Back in the western edges of the desert country we left behind the mountains just arise out of the ground along the many the fault lines of seismic activity several of which are clearly visible. Just two days after we leave the high desert country of California it is shaken by an earthquake that is 7+ on the Richter scale. Our route east paralleled the very railroad track near Barstow, California where the force of the quake derailed a train. We talk about our luck as we approach the Smokey Mountains of North Carolina. As it has been all across the United States cars continue to approach and slowly pass, many pause and yell over the wind and engine noise. Others call up on the citizens band radio. 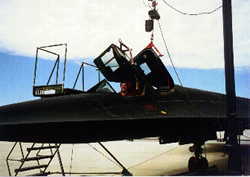 "Yes, Its an SR-71 Blackbird!" "The Virginia Aviation Museum in Richmond, Virginia!" The reply to our answer is always a big smile and often an enthusiastic thumbs up. The Smokey Mountains are at hand now and we gear down for the long climb ahead. On the citizens band radio we pick up the transmission of the truck with rear half of the Blackbird's fuselage and its escorts. Because the rear fuselage is broader than the forward fuselage it has to have escorts fore and aft of the truck. They are about ten miles ahead of us. Unlike the western, southwestern and plains parts of our Interstate-40 East journey it is very obvious in the mountains of North Carolina that Fall has arrived. The steep rolling mountains are washed in color. At the bottom of each little valley runs a clear, cold, mountain stream. The road curves and twists above above these rocky streams. These mountain roads are not the place to be driving in during winter snow and ice storms. Shortly after we crest the mountain top traffic comes to a stop. Rockslide? Rubber necking at wildlife? We don't know. It is warm as the Kenworth is not air conditioned so we pop the doors and monitor the the c.b. radio. 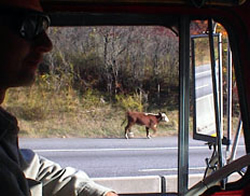 Soon enough we hear the cause of the hold up - overturned cattle truck at the narrowest part of the road. Every minute we wait pushes our arrival time in Richmond farther and farther back. Escaped cows start passing us on the right and left. Finally the east road is clear and we start down the east face of the mountains. The other side of I-40 is still closed and people are standing outside of their cars. When they see the Blackbird hurtling by they wave and smile. We pull on the chain to the big truck horn and the Blackbird gets an even more enthusiastic response as we pass the rest of the stopped cars. We catch up with the truck with the back part of the fuselage and convoy to Hickory, North Carolina for the night. Last day on the road. Last dark morning to throw the travel bag in the truck. The Virginia Aviation Museum is about nine hours away. Out in the parking lot of a motel in Hickory, North Carolina sits the fore and aft fuselage sections of SR-71A #617968. still mounted on the beds of two tractor trailers. Today we bring the legend home. First, the weather. Hurricane Irene had been washing up the coast. Forecasts called for the storm to turn east overnight. The morning weather reports confirm this prediction and we are very happy. Any bad weather will slow our arrival. It is chilly as we walk out and there is dew on the Blackbird. The stars are still out though the horizon is pinking with the sun. One last morning walkaround checking the straps and supports. Everything from flat black fuselage to assorted parts are still tightly chained and strapped and riding well. Running lights and orange rotating beacons are good. We go eat. The big Kenworth spools up after breakfast and we pull out in convoy with the other rig and the chase vehicles. Instead of a straight shot up Interstates 40, 85 and 95 we have to take several detours because of the width of our fuselages. We drive the by-ways around Winston-Salem, Durham and lower Virginia but finally start to close in on Petersburg. The cell phone in the truck rings. We estimate our arrival times to the museum so that every thing can be set up for the press. Presently we pass over the graceful Varina-Enon Bridge over the James River. We call in this reporting point and Ben Nattrass of Worldwide Aircraft Recovery gives us parking directions. There will be a lot of big trucks at the museum. We wind around I-295 turn on to I-64W and then finally Airport Drive leading to the Richmond International Airport. The museum shows up at our two o:clock position and we guide in on it. We have brought the legend home without a scratch in five days. A Blackbird in flight can cross the United States in about an hour but this crossing brought her closer to the citizens who still take a real pride in her. This aircraft still is a scientific achievement. Every parking lot, every fuel stop, every straight stretch of road drew all kinds of people who reverentially looked at this piece of history and carefully explained it to their children. We gently pull up to the museum and shutdown amid the smiles of staff and friends and flash of cameras. It is good to be home. The first couple of days after the transcontinental trip are a blur. All the responsibilities of a month's absence come home to roost but I wouldn't trade the adventure for anything. We did arrange the parts in the proper order to begin the reassembly. I remember it rained one of those days and being glad we had the foresight to tarp what needed covering. One of these days was Career Day at the airport. There is an invisible, cool-airplane radar buried in the brain stem of all pilots and the military pilots that flew into Richmond International Airport somehow managed to find the Blackbird. When their Career Day duties were over the Blackbird was saluted by a Navy F-14, Marine F-18 and Air Force F-15 racking into turns directly overhead while outbound. Noise abatement procedures were followed to the letter. By Thursday the rain stopped and work on the Blackbird continued. Parts that had been pre-positioned were prepared for reassembly. The outer wings and nacelles were parked the farthest out as they would be the last parts reattached. In the early morning hours they looked like the flukes of some prehistoric beast. The two trailers with the fore and aft sections of the fuselage were parked close together. Through careful manuevering of the support stands and screw jacks the fuselage was made one again. From this point the rest of the reassembly could take place. If the outer wings and nacelles looked like flukes the joined fuselage was speed itself sculpted from titanium. From the front, the aesthetically pleasing serpent-like appearance makes you understand how this aircraft became known as the "Habu", a fearsome snake indigenous to Kadena, Okinawa. This was one of the locations from which the Blackbird flew. Our "Habu" was starting to come together. Word of our Blackbird has filtered out to the community through the media and airport word of mouth. A steady stream of people drive into the museum's parking lot, get out of their cars and patiently stand watching the reassembly of the inner wings and nacelles to the fuselage. Ben Nattrass of Worldwide Aircraft Recovery watches with an practiced eye and calls out instructions to the rented crane and his experienced crew. What is it about the Blackbird that commands this kind of homage? In the history of aeronautics in the United States there have been thousands of aircraft retired from both the civil and military inventory. The more famous are paid homage rightly due the successful but obsolete designs but this homage is somehow different. From time to time we take leave of our ordinary museum duties and walk the visitors around the Blackbird taking care not to impede the progress of Worldwide Aircraft Recovery. The aircraft has not been cleaned and does not yet have a museum appearance yet the visitors look and photograph knowing they are seeing the inner workings of a legendary airplane. One of the visitors remarks, "Nothing can touch this." And there you have it. This homage is different because this aircraft is still a viable platform and doesn't yet fit the description of obsolete.